The use of robots in physiotherapy offers the opportunity to increase the dose, intensity and specificity of rehabilitation. REX is used by physiotherapists for people with mobility impairments, in rehabilitation centres in the US, the UK, the Middle East, Australia and New Zealand. Rex Bionics is working with rehabilitation specialists to develop the practice of Robot-Assisted Physiotherapy. 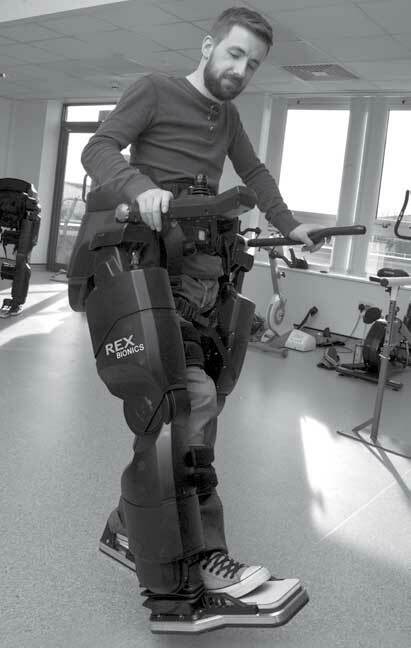 REX lifts patients from a sitting position into a robot-supported standing position, allowing them to take part in a set of supported walking and stretching exercises, designed by specialist physiotherapists to help achieve rehabilitation goals (REXERCISES). REX does not require the use of crutches, leaving the arms free for upper-body exercises and activities of daily living; and allowing access for a wide range of patients. Wheelchair users are at risk of developing numerous medical complications from extended periods of sitting. By enabling them to spend more time standing, walking and exercising, REX may offer significant health benefits. A programme of clinical trials is under way to evaluate these potential benefits. Learning to use REX is quick and easy for the user and because it is fully adjustable to the individual within 5 minutes, it allows a high rate of use in a clinic. REX also limits the burden on the therapists during manual handling and reduces the amount of help required to assist patients who are undergoing standing programmes. 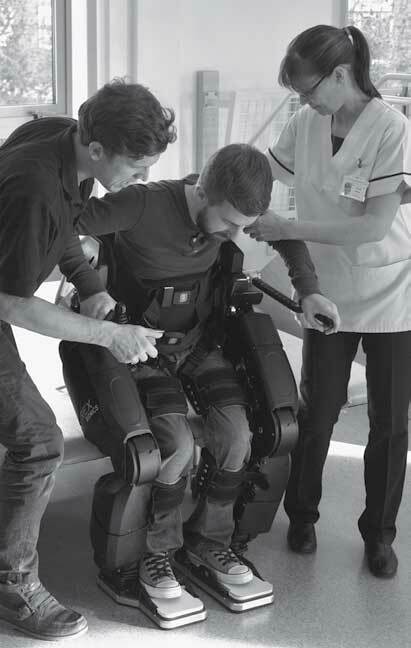 Standing, while completing exercises and strengthening in a stand-alone robotic exercise device offers a range of interesting rehabilitation opportunities. Exoskeletons are an increasingly common tool in rehabilitation. However most need to be used with crutches or a walking frame. “These robotic rehabilitation systems have the potential to offer individualized therapy, increased efficiency of training at a lower cost, and new sensing capabilities to the physical therapist to quantify patient’s progress. The availability of safe and reliable robotic therapy can also facilitate intense practice – at a reasonable cost- as well as continuous challenge during rehabilitation, which is known to accelerate recovery and improve rehabilitation outcomes. However, most exoskeleton devices are currently limited to patients with intact upper body function for aided support via crutches (a notable exception is REX, which does not require crutches for balancing and stability). This is an important limitation in current exoskeleton systems as stroke patients and quadriplegics lack control on at least one side of their bodies and cannot use a walker or crutches to stabilize their body effectively”.